This is a classic route on a classic tower reputed to be one of the hardest peaks to attain in Washington. The upper pitches are beautiful alpine granite offering many variations depending on how hard you want to make the climb. Below I will describe the standard 5.8 route which is quite an adventure in and of itself. Many traverses, some down-climbs and lots of flakes and cracks of all sizes make this climb a tough yet varied climb that will test your route-finding and climbing skills. There are not any real pumpy or difficult sections if you stay on the route described below but the difficulty can rapidly increase if you venture onto one of the off-width variations. 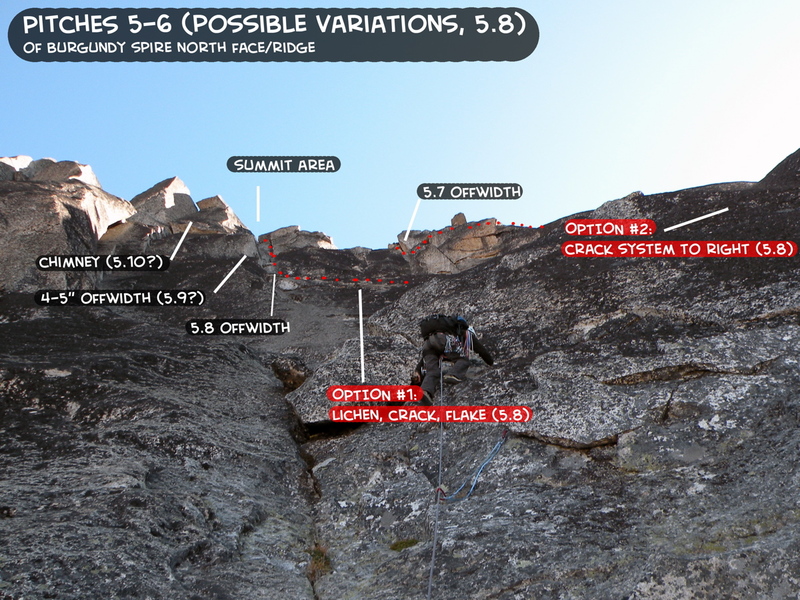 If 5.8 alpine trad is at or near your limit, it's best you study the route carefully beforehand. From Seattle, take I-5 north to Burlington and continue east on WA Highway 20 (North Cascades Highway) all the way up and over Washington Pass. This drive takes about 3 hours. Liberty Bell towers above Washington Pass. Descend down the east side of the pass for 3.75 miles, passing the hairpin curve, and park at the long pull-out on the east side of the road at 4,310 feet in elevation. This is the trail-head and you need to locate a faint but noticeable boot path leading down the loose talus to the east. Locating this path is critical, once you find it, follow it down on very loose and scree covered talus and into the trees where it becomes a nice trail. You will pass by a registration box just before reaching Early Winters Creek. At 4,080 feet, cross the creek on one of numerous logs and continue up the trail which winds through the forest for a quarter-mile, then steeply ascends in-between two small creeks. Doing this ascent in the morning is recommended as you will have cool shade since it's a west facing slope. At 6,460 feet you will arrive at a nice flat bench which makes a great campsite if you plan to make it an overnight. Continue on the trail above the bench as it climbs up and traverses scree gullies until reaching the 7,770 foot Burgundy Col which is 3,700 feet above Early Winters Creek. The final 1,000 feet to the col really is miserable due to the ball bearing scree covering solid rock. The floods of September 2013 didn't help matters either. Follow cairns for the easiest way. 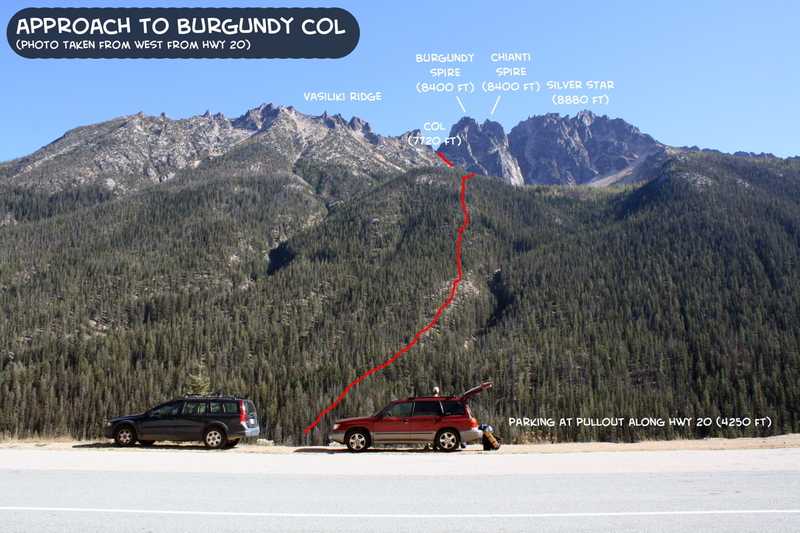 The nice thing about this climb is that you do not have to do a carry-over, therefore you can ditch any extra gear at or near the Burgundy Col.
Map showing the approach to 7,770 foot Burgundy Col. It's a Class 1 trail to the 6,440 foot flat bench, then it's loose kitty litter Class 2 to the col. Described below is a description of each pitch the way I did them in September, 2013. We did a total of eight pitches and kept the entire route at 5.8 in difficulty (though I thought it was more like 5.7). 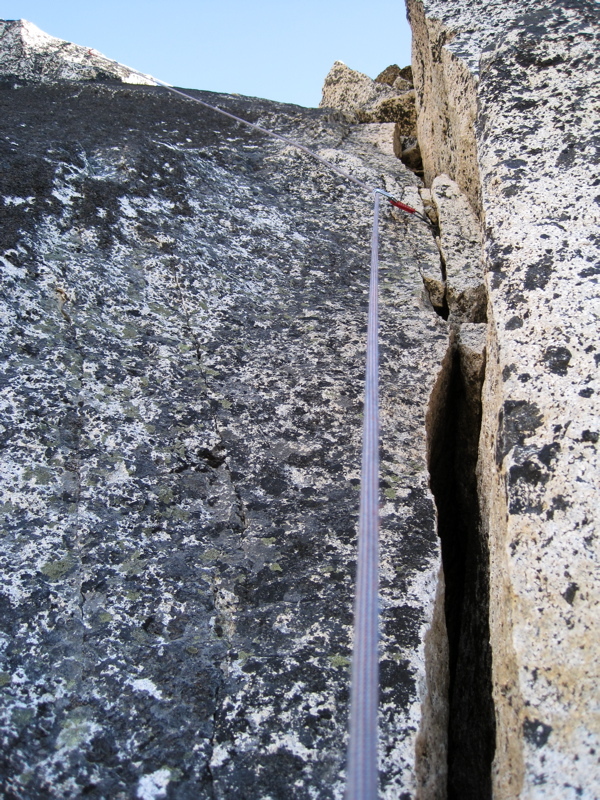 Rope drag on this route can be a serious problem so combining pitches may not be the best idea. Use your best judgment though. From Burgundy Col, descend about 20 feet to the west and locate an obvious chimney/gully heading up just to the left of the huge vertical face coming down the north side of Paisano Pinnacle. 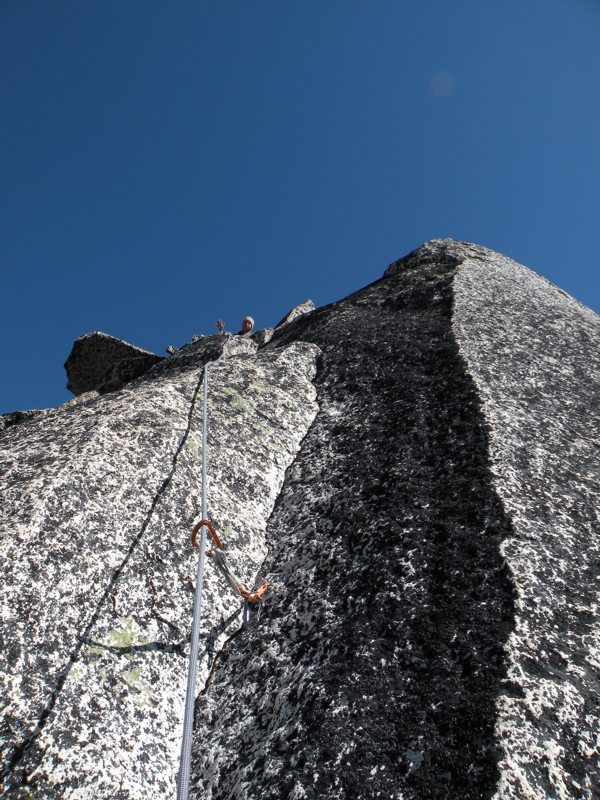 The idea for this first pitch is to climb the weakness between this Pinnacle and Burgundy Spire itself. After a full 60 meters, belay on a large slung horn. Plenty of pro options. This pitch doesn't have much climbing at all as it's mainly a scramble up scree ledges to the start of more technical climbing on the north face of Burgundy itself. From the belay atop the first pitch, scramble 15 feet of 4th class rock to the huge ledge above. Hike up the kitty litter covered ledges passing by the top of a deep gully dropping to the left and reaching the base of the north face proper after about 45 meters. Walk left on the uppermost scree ledge until you are right below a series of flakes. No pro on this pitch. This pitch starts by climbing the sketchy flakes just above and veering left on a ledge to the base of a near vertical, right facing crack system. Be very careful how you grab these flakes at the base of this pitch. They are great holds but many of them are hollow and ready to break. After 40 meters, reach the near vertical dihedral and belay. Sparse pro. Now the fun begins! 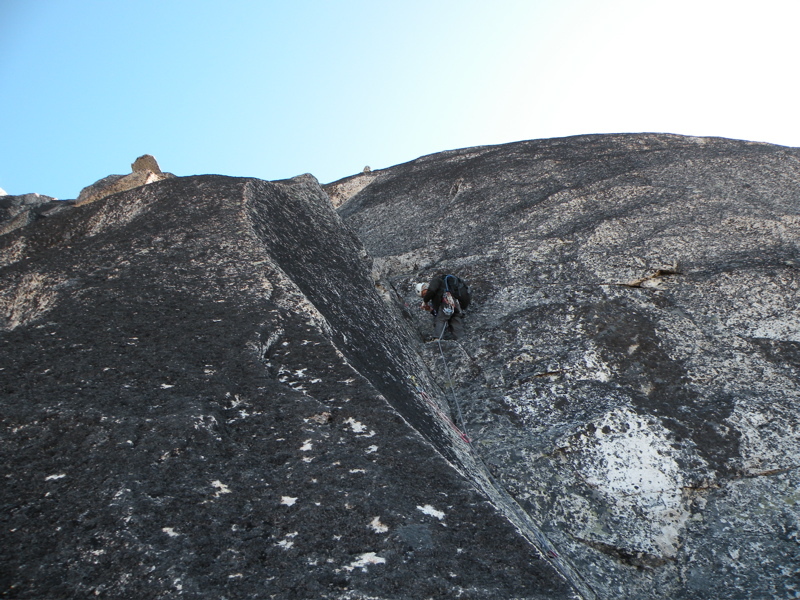 Climb straight up the crack system for about 20 feet and traverse back to the right on a nice ledge. Climb up a tricky 10 foot crack to reach a second ledge and continue on the rightward traverse on this narrow ledge as it descends slightly. At the end of this ledge you're at the base of a large crack and flake system with a large block with numerous slings wrapped around it. Climb these cracks and flakes to the huge boulder and belay here. Be sure to place adequate protection on the rightward traverse to avoid a pendulum fall for your second. 45 meters total length and plenty of pro options. Rope drag becomes pretty bad. From the huge slung block atop the forth pitch, continue straight up the now vertical flakes and cracks (5.8). This was one of the best parts of the climb. As the angle eases continue along the widening cracks slightly leftward, then when you reach a headwall, traverse 15 feet back to the right and onto a huge ledge. Belay here. 35 meters and plenty of pro. This pitch doesn't have any climbing but it is very important you get this right. Traverse the huge ledge to the right for a long ways...more than you think you need to. You will be forced to descend about 15-20 feet midway across then re-climb a short ways and pass under a gigantic block that makes a large archway. Once you pass under this locate another small slung horn and belay for the 7th pitch here. This ledge traverse is best done un-roped. The photo below shows this arch. From the belay just across the arch, begin climbing up a big flake just above and to the right. Continue traversing to the right more than you think you need to until a crack system appears. Don't let the blank, lichen covered rock above you get to your head. Just keep traversing around the corner. 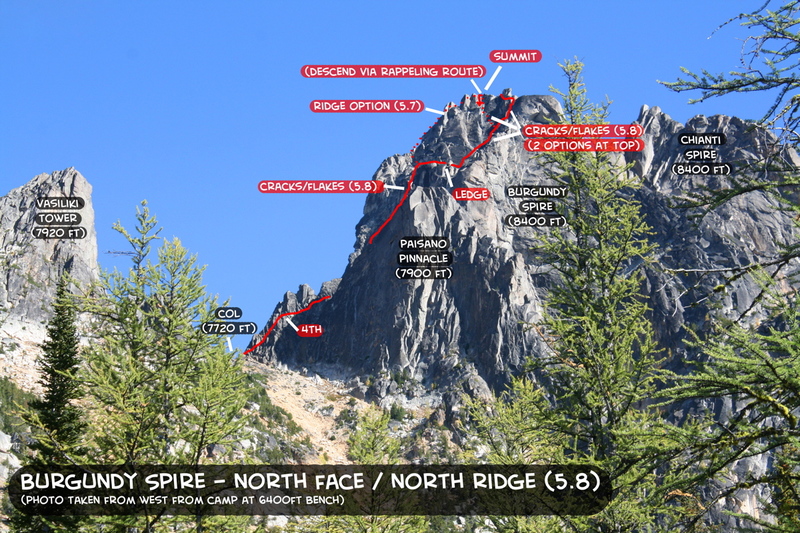 Once at the base of the crack system, begin climbing an open dihedral, passing by a fixed piton and reaching a nice big ledge with your first views of Silver Star Mountain to the south. Belay here. 45 meters total length with somewhat sparse but good pro. This pitch is probably the crux of the route. From the giant ledge where you are greeted with your first views of Silver Star Mountain, climb a thin finger crack (shown at left). If you have small fingers this works well but if you are tall, use the face holds just to the left of the crack. There are just enough holds to keep the route at 5.8. 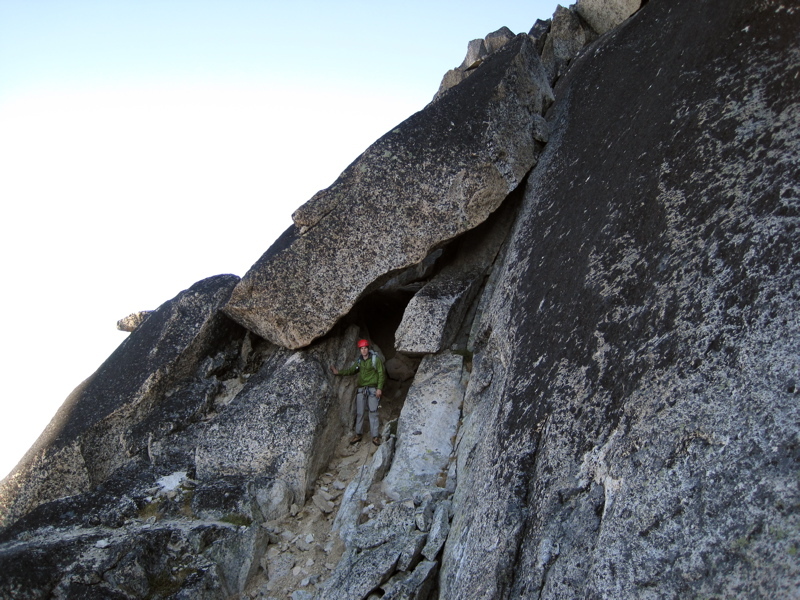 Above this, continue up near the crest of this ridge and when you reach a huge fin, traverse left around it and finish the climb on a 25 foot off-width crack (shown below) which dumps you off on the summit ridge to which the summit is a short stroll away. These photos were provided by Steph Abegg and provide an overview of the other options on the route as well as a visual for the standard route I described above. OK so you are on the summit and it's probably getting dark and you need to get down. First and foremost, the rappelling will be expedited if you brought double ropes therefore that's the way I will describe the descent. If you only have a single rope you can still safely get down as there are slings all over this peak. With double ropes, there are 5 raps. From the summit, there is a huge rock with about 10 slings wrapped around it. Rappel off this bomber anchor about 40 meters down the middle of the upper face (well to the climbers left of your ascent route) to a bolted anchor on a ledge below. If you have a single rope, you will have to down-climb 10-15 feet to get to the bolts. Rappel 55 meters from the bolts down the lichen covered face all the way down to the huge ledge next to the big arch. Cross back under the arch and locate the next anchor just on the other side of the arch which is a large constriction rock with a handful of slings. 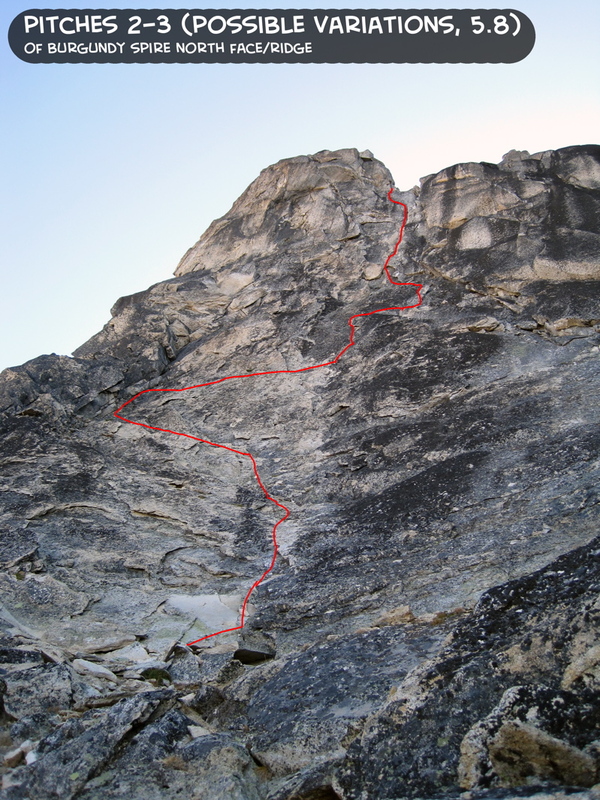 You could also traverse all the way back across the huge ledge and use the anchor you used at the top of the 4th pitch. If you have a single rope, you will have to find/make an intermediate anchor halfway down the face. Doing this may make it possible to reduce the number of rappels to only four but since I didn't do this I can't say for sure. If you only have a single rope you MUST traverse all the way back across the huge ledge and rappel from the anchor at the top of the 4th pitch and continue rapping your climbing route. There are many slings. Rappel 55 meters from the constriction anchor next to the arch which starts as a small overhang, then continues down more lichen covered rock to a horn with a blue sling around it. This horn is off to the climbers right of the route you climbed. Rappel 40 meters from the horn as described above to the large scree covered ledges. Exercise caution pulling the rope on this one. Locate an anchor at the very top of the first pitch chimney. Rappel a full 60 meters to the base of the first pitch. If you have a single rope, use one of many intermediate anchor options. Helmet, at least a 60 meter rope, double ropes preferred, set of nuts, full set of cams to 4", 10 alpine draws, rock shoes. I really liked having the C4 and I placed it three times however if you are very confident on 5.8 you can forgo it. If 5.8 is near your trad limit, bring double Cams of 0.5, 0.75 and 1 as well.